Whether hot or cold, adverse weather can practically kill your car battery. Battery care during winter is not something most people consider; it is, however, very vital to a car battery’s life. The gist of this article is to provide any car owner out there with a guide on how to deal with a car battery in extremely cold weather conditions. Most automobile repair shops have the equipment to measure your battery’s charge holding capacity. The capacity is measured in Cold Cranking Amps aka CCA. By knowing the level of your battery’s CCA, you become aware of the level of functionality your battery would give off during cold weather conditions. This, in the long run, helps a great deal in extending the life of your car’s battery. Additionally, it aims to be a guide when looking to buy a car battery that has a higher tolerance for a cold environment. When Is It Time To Replace Your Battery? When it comes to cold conditions, this battery tops all the rest with constant outstanding performance. Designed specifically for starting battery, it delivers a profound amount of reliable starting power at all times. Poor weather does nothing to reduce its effectiveness making it a perfect battery choice in extremely cold conditions. 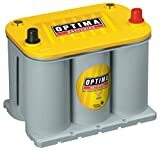 The Optima RedTop 34 battery’s unique design is not just for the sake of a good appearance, it serves a vital purpose in its general performance. Its spiral cell technology primarily improves the quality of its performance by monitoring its tolerance to temperature, humidity, and automated conditions. On top of that, the same spiral wound cells reduce the battery’s rate of degradation while increasing its resistance to vibration. The battery comes with 12 voltage capacity, 800 cold cranking amp, and 100-minute reserve capacity. Its design makes it virtually mountable in any position not to mention the use of an absorbent glass mat that ensures no acidic leakages. This battery provides a tremendous amount of ignition power that favors off-road units. It is particularly suitable for use in most stock vehicles. The Optima RedTop 34 holds a remarkable amount of starting power that will kick any automotive to life no matter how cold it is. 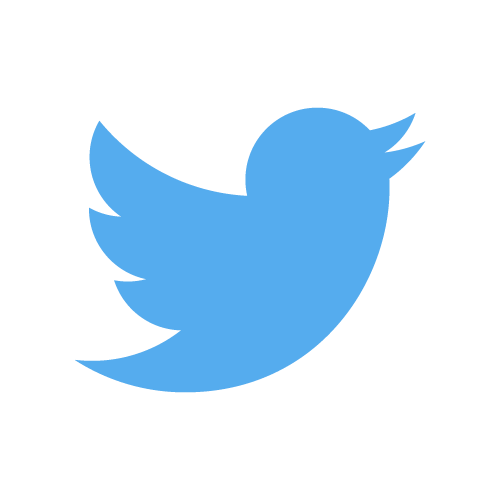 It is a rather popular battery brand and the reason behind this is rather evident. Even in adverse weather conditions, this battery proves handy in firing up even the most powerful automobiles. This unique spiral cell designed battery is a magnificent modern day battery alternative for any automobile. 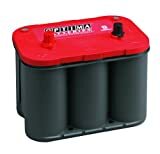 The Optima battery series comes with three different top batteries. This particular one, the YellowTop, is specially designed for automobiles that demand higher than average electrical loads. If your vehicle has multiple electronic accessories or it simply lacks an alternator, this battery would work just fine for you. The Optima Batteries 8040-218 D35 delivers a solid 620 cold cranking amps and 12 voltage discharge capacity making it rather powerful. That is why it can effortlessly support an automobile’s multiple electronic accessories. Being only 36.4lb, this battery is smaller than an average battery making it particularly suitable for vehicles with limited space. Its spiral-cell technology feeds its high vibration resistance feature relatively extending its life cycle. Its dual purpose feature makes it usable as both a starter or deep cycling battery. Use of pure lead on its spiral cells makes extends its life over twice compared to other batteries. For the icing on the cake, it also has a 98-minute reserve capacity to offer. Although smaller than usual, this battery delivers a tremendous amount of power enough to fire up any car or small boat. Its dual purpose capabilities only make it a worthier choice than most. The first thing you notice about this Kinetik battery is how cheap it is. If you’re working on a budget but you still want a good quality battery, the Kinetik HC1200-BLU battery offers just that. It is suitable for high power car audio systems, with the ability to support an audio system of up to 1200W. Even at its incredibly affordable price, this battery has to be surprisingly efficient. The Kinetik HC1200-BLU has a 1200W, 12V power support. The fact that it is packed with more plates that facilitate stronger energy density dissipation easily makes this possible. Added to that is an 1150 cold cranking amp that evidently backs its ability to function efficiently. Its sealed absorbent glass mat leak-proof design makes it even more convenient to use. Other than being maintenance free, it also has a high resistance to vibration and extreme heat conditions. Finally, this battery comes with an ultra-low equivalent series resistance that ultimately increasing its current discharge levels at any given time. Since during cold seasons a battery may have to deliver more power than usual to start the engine, this battery works perfectly in such a situation. The Kinetik HC1200-BLU battery proves price doesn’t always affect performance. Considerably affordable, this battery outdoes many batteries that fetch a significantly higher price. 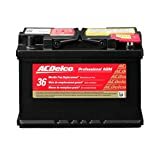 Manufactured by AC Delco, a company known for the production of high-quality auto parts and products, this battery obviously has a lot to offer. Generally, AC Delco 48AGM Professional battery brings to the table a pretty good bargain for a reasonable price. Let’s take a look at how. This battery enjoys an increased life cycle (up to 70 Amp Hor) due to its high-density negative paste. For improved performance, it is fitted with silver calcium stamped alloy which also contributes to its extended service period. Its overall vent cap design is tough enough to tolerate most conditions, for instance, salty and icy conditions. Additional oxygen recombination makes it a maintenance-free battery and also drastically reduces water loss. A maintained pressure on its plates prevents loss of active mass from the grid. Equipped with enveloped puncture resistant separators, the AC Delco 48AGM Professional battery manifests better acid circulation. The AC Delco 48AGM Professional battery is definitely one you can trust to perform splendidly given its manufacturer’s reputation. It is also highly recommended when it comes to high-end vehicles or situations that generally require huge power draws. There are several reasons why a car battery would normally die during winter or cold weather conditions. In order to successfully protect the car battery, a little understanding of what exactly happens is important. Below is a short list of some of these reasons. Over time, a battery loses its capacity to hold a charge even after a recharge. Cold conditions interfere with primary processes within a battery that facilitates its functionality. This means that the battery may feel a bit more sluggish as compared to when the weather is a bit more warmer. The fact that the battery may not be able to hold a charge like it did before only worsens its overall performance. You may have to jump-start your battery more often than you may want to when winter finally comes knocking. When its cold, the car’s electrical system has to work a bit harder to feed the starter motors. In some cases, especially where the battery is over three years old, this may cause its death. In other words, the battery may not be fully up to that particular task. Power draw by accessories such as lights, wipers, and the heater also works up a battery in these conditions. Unfortunately, one may not always be in a position to control the use of accessories in a car since most of them are more or less unavoidable when driving. Parking an automobile in an enclosed space, for instance, a garage has proved rather helpful when trying to dodge battery breakdowns in cold weather. If possible, keep the garage heated all night through. This way, the car remains warm ultimately evading any cold-related complications. When the car is not in use, especially at night, it is advisable to turn off all power loads. By doing this, you avoid possible power drain to your battery. The battery runs through chemical processes; this explains why corrosion is a rampant related condition. Even if in full capacity, corrosion is a threat to any battery life. Cleaning the battery every once in a while is an effective way to ensure the battery works at full capacity no matter the weather. Sadly, no matter the amount of effort you put into keeping your battery in top notch condition, a time comes when the need to replace it becomes undeniable. This is because even the best of batteries eventually wear out. The good thing is that you can easily notice when it’s about time, thanks to the few signals the battery manifests. Below are few of such indicators that will help you know its time to replace your car battery. This probably the most common of all red lights. It is never a good sign when you turn the key and all you get is an engine crank. A crank with no actually start is a perfect indicator that the battery is tiring up. 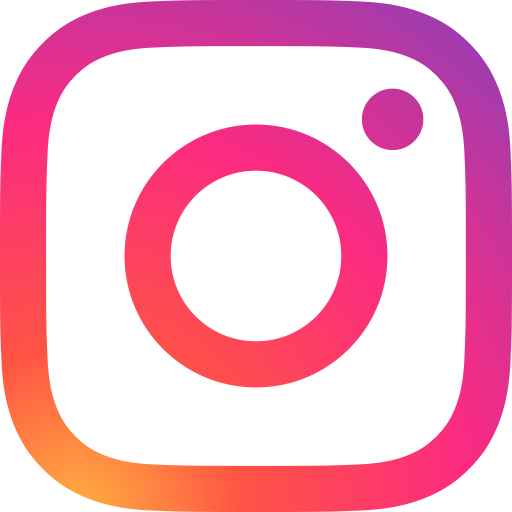 Although this may not always be the case, a few such experiences should be enough to get you on your feet and looking for a battery replacement. In other cases, the car will start with a crank. It, however, may take quite a while to do so. Slow engine crank is another indicator you cannot afford to ignore. An immediate test is essential once you notice such symptoms to avoid any later inconveniences. This is usually due to battery leakages and often smells like rotten eggs( typically the smell of sulfur). These leaks corrode the battery deteriorating its condition and performance. You can clean the battery to counter this. Even so, if it persists, it is definitely an indicator that it is about time to get a new one. The older your battery grows, the higher its chances of burning out. Typically, batteries last for three to five years, depending on the conditions of their environment. Once your battery hits the three-year mark, you should keep tabs on its functionality. That goes without saying. Even with no prior knowledge, a swelling battery is definitely a cause for alarm. This is usually as a result of constant overheating. 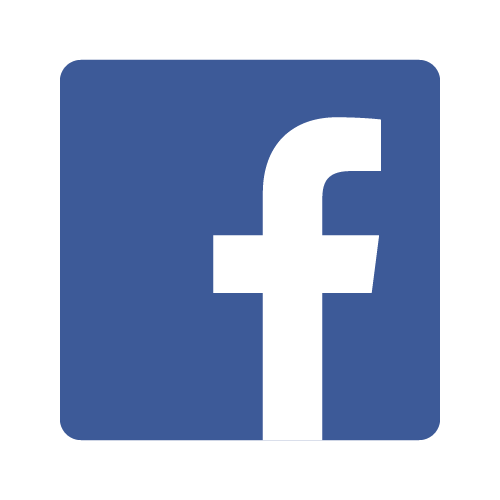 A battery test would be in order once you notice this signal. Now that you understand why your battery may act up during winter, let’s get down to the core subject of this article. Battery manufacturers recognize that cold weather conditions are not the friendliest to your car battery. The market offers a good number of batteries that are a better option in such conditions. The following are short reviews of such batteries. This article goes a step further by indicating the best overall option, the cheapest and such. Based on the above reviews, adverse weather conditions don’t always mean struggling to start your car. With the right battery, you can go about your everyday activities without a single worry. Although each of these batteries has something special to offer, they all share the ability to keep functioning even in subzero conditions. Depending on your taste and preference, any one of the above batteries should relieve you of any pressure that might have been brought about by your old battery during cold weather seasons.